This is one of the most interesting books I have purchased this year 2009. It's my favorite book! Definitely a good investment -- especially if you are fond of cooking. For those who have been to Paris, who love French food and has some interest in cooking, you will surely find this book a good read. I have always been in love with Paris. I love the feeling, the sights, the beauty and the kind of life they have there. Hubby and I have been visiting every year (except for this year bec of my pregnancy). And every year I go back I am still at awe at how I can feel when I am there. This book brings me back to those wonderful places in Paris. Plus more insights as the girl in the book describes her experience when she enrolled in the famous cooking school : Le Cordon Bleu. The book shares her experience as a normal 36-year old middle manager who just got tired of corporate life. She took the plunge and tried to have an adventure of a lifetime by flying to Paris and enrolling herself in cooking school. It was very inspiring to read! Sometimes I wish I had the guts to just do that! I was definitely inspired to cook and try out some of the recipes which she shared inside the book. Yes, there are recipes that you can test out :) which makes this book even more interesting. Did I mention that I was so into this book and the time I was in my 2nd trimester -- which meant it was aligned to the time I had great appetite! That was also the time I kept on blogging about different restaurants. It was weird --I had cravings for different dishes for different days! Hubby had to keep up with me. But mostly I craved for Japanese food -- tempura yummy! In case you are looking for a new and different book to read, do check out this one. Happy reading! PS. for those people who have encountered relationships or conversation with French people, you will find some funny moments at the girl's adventure (and struggle) with the French language. 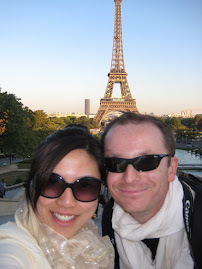 I myself have been improving my French -- but not yet good enough to go wondering about alone in Paris! In case you want to learn French, I highly suggest enrolling yourself at Alliance Francaise . They have one in different countries. I enrolled myself few years back in Alliance Francaise Manila. And I also took some classes here in Kuala Lumpur. It's a good place to start your French language. Great blog that you maintain! I want to ask you a question reg ur french classes - are you writing any exams after u finish them or are you just taking spoken french classes? I just wrote my delf A2, and want to continue till B2. Any suggestions? Hi, I'm currently taking classes at Alliance Francaise so I can prep for the upcoming Delf this march 2013. They have a book called Agenda which we use.. Classes are both speaking, writing, conjugation ... Suggest u continue classes bec it is different when u are there and you get motivated and immersed in French culture .. Plus being among students who want to learn helps a lot. I never took any Delf exam until now... And plan to gear up for Delf B1 exam this March ... Yikes! Elcerdo: A Place for Serious Pork Lovers!